This module contains a series of functions to operate on q-grams as well as two q-gram index data-structures together with very high throughput parallel construction algorithms and efficient q-gram counting primitives. 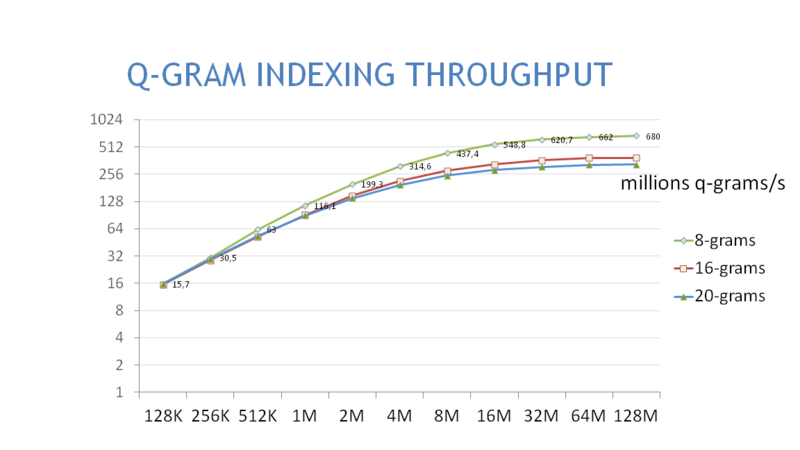 The first graph shows the throughput of NVBIO's q-gram indexing algorithms on a K40 GPU. The benchmark consists in building a q-gram index on differently sized subsets of the 8-, 16- and 20-mers obtained from a set of 1M x 150bp reads (SRR493095). 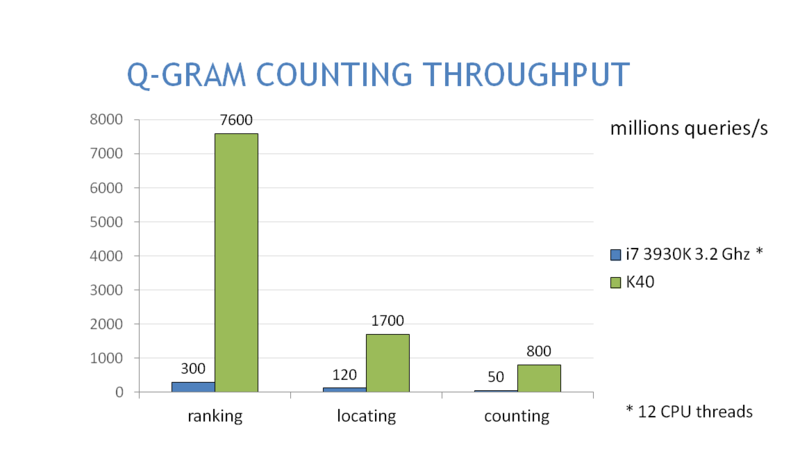 Notice that the throughput increases with the size of the set, until it saturates around ~32M q-grams. the compact Q-Gram Index, which can be built over a string T, with memory consumption and query time proportional to O(|T|) and O(log(unique(T))) respectively, where unique(T) is the number of unique q-grams in T. This is achieved by keeping a plain sorted list of the unique q-grams in T, together with an index of their occurrences in the original string T. This data-structure offers up to 5x higher construction speed and a potentially unbounded improvement in memory consumption compared to the Q-Group Index, though the query time is asymptotically higher. Q-gram indices can be built both on strings and on string sets (in which case we call them set-indices). The difference relies on the format of the coordinates associated to their q-grams: for strings, the coordinates are simple linear indices, whereas for string-sets the coordinates are (string-id,string-position) index pairs. const char* a_query_string = "CGTACGTACGTACGTACGTACGTACGTACGTACGTACGTACGTACGTACGTACGTACGTACGTACGTACGTACGTACGTACGTACGTACGTACGTA"
// use the plain-view of the q-gram index itself as a search functor, that we "apply"
This of course was just a toy example; in reality, you'll want to this kind of operations with much larger q-gram indices and much larger batches of queries. The previous example was only showing how to get the ranges of matching q-grams inside an index: it didn't show how to get the actual list of hits. One way to go about it is to ask the q-gram index, which given an entry inside each non-empty range, can provide its location. This can be done using the qgram_locate_functor. However, if one is interested in getting the complete list of hits things are more difficult, as the process involves a variable rate data-expansion (as each range might expand to a variable number of hits). for string-set indices, the coordinates are (index-id,index-pos,query-idx) tuples represented as a uint4, where index-id and index-pos are the index into the string-set used to built the q-gram index. Finally, the generated hits can be sorted and merged by diagonal bucket, effectively performing so called q-gram counting. A complete list of the classes and functions in this module is given in the Q-Gram Module documentation.